We all use the Instagram app on the daily basis because we love to share photos and videos with others. Everyone wants to be famous on Internet and for that they can do anything. It’s called addiction and it’s not good at all. You can use this platform to make a huge money also. Sometimes you want to promote your Instagram post also but you don’t know how to do it. In this article, I am writing a proper method to promote your Instagram post successfully. 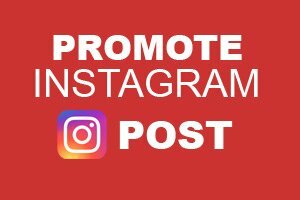 If you follow these steps then you will be able to promote your photos or videos on Instagram. Step 2. 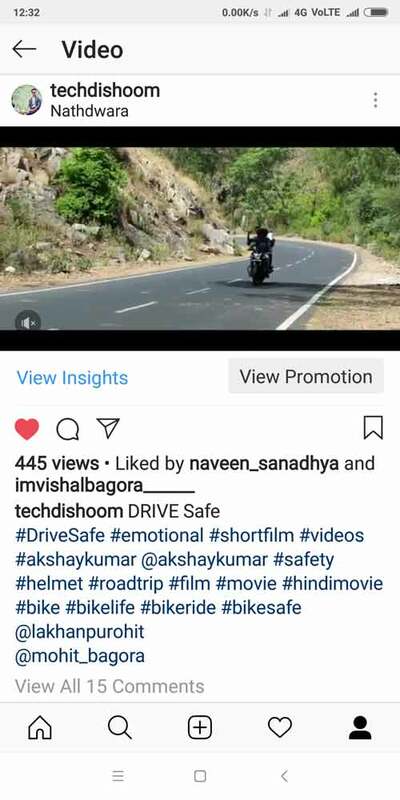 Now go to the Instagram app and select a post which you want to promote. Now as you can see in the below image there is a button called “Promote” you can tap on it. Step 3. 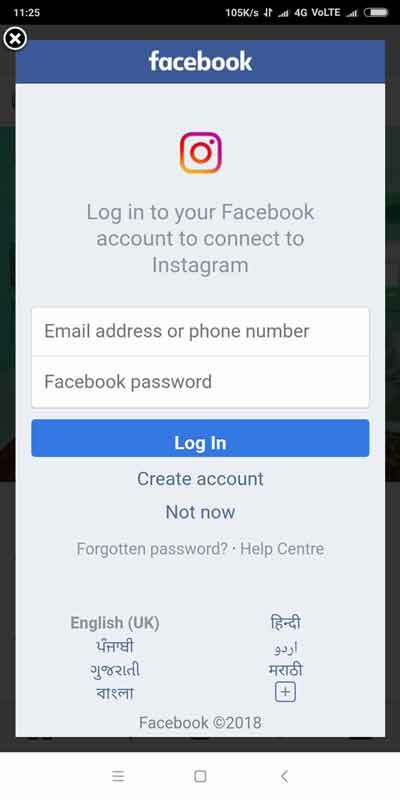 After tapping on the “Promote” button you will be asked to login into your Facebook account. So let’s do it. Step – 4. Once you login into Facebook account you will see a popup like shown in below image. Just tap on “Create Promotion“. On the next page you need to select your goal which means what you are expecting from this promotion. 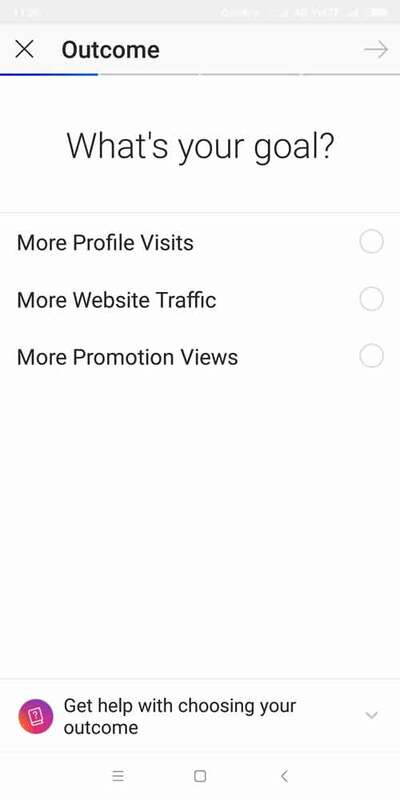 There are three options “More Profile Visits“, “More Website Traffic“, “More Promotion Views“. If you want website traffic then you can go with that option otherwise I recommend you to select “More Promotion Views” because you will have more ad impressions. Well, What are impressions? We will talk about it later in this article. Now tap on Next. 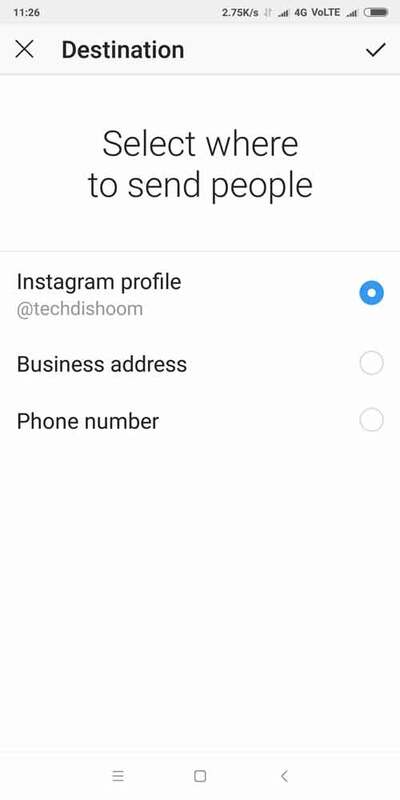 In this step you need to select “Instagram Profile“. But if you want to send people to your business address or phone number then you may select other ones. In this step, you need to select your audience. 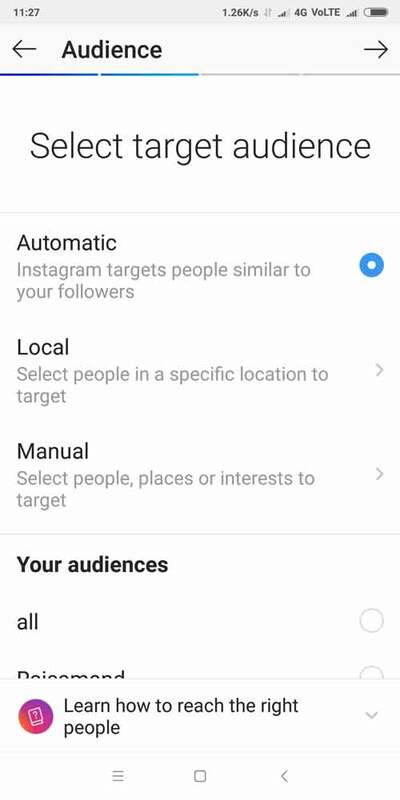 It means where you want to show your Instagram ad like if you want to target any country or state or city then you can select “Local” but if you want to target audience from a specific place with interests then you can go with “Manual”. If you are still confused then go with “automatic”. Well, In this step you have to be more careful because it’s payment time. As you can see here we have 2 sections “Budget” and “Duration“. 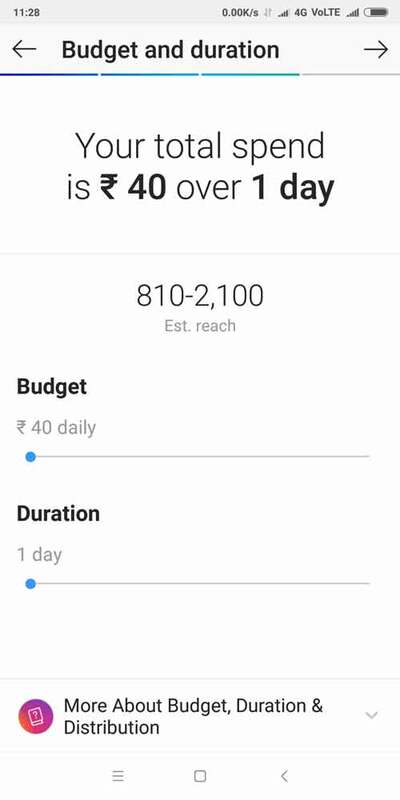 How much amount you want to spend in a day is your “Budget” and duration is simply how many days you want to run your Instagram ad. If you select 40 Rs budget and duration 5 days then total amount you will spend is 200 Rs. What are impressions on Instagram? If someone sees your Instagram post then it is called one impression. Imagine 120 people sees your Instagram post then Impressions will be 120. Instagram shows estimated reach which means actual impressions. It shows only estimated means there is no fixed amount of impressions they can provide you it’s all up to the Instagram algorithm. Once you set your budget you will be landed on this page where you need to review all the details. 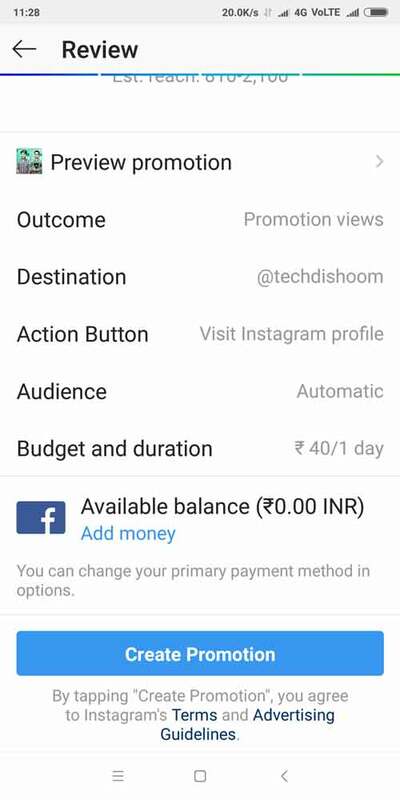 As you can see at the bottom there is a section “Available balance (0 INR)” here you need to add some money in your Facebook Wallet which is connected to your Facebook Ads Manager. Tap on “Add Money”. Here you need to add money in your Facebook wallet via your debit/credit card or PayTm (For India only) or Paypal. You can select any of these payment methods to add money. 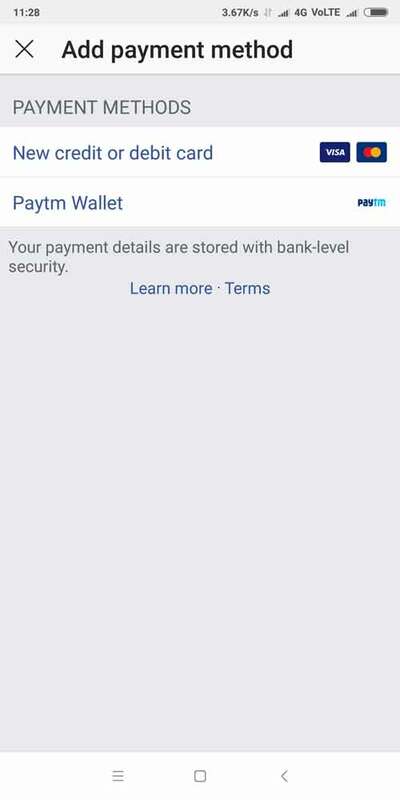 If you are from India then I recommend you to use PayTm payment method and If you live outside India then use the PayPal payment method. Adding credit/debit card info directly will save your info on your Facebook Ads Manager. Well, You can remove your Debit/Credit card info from Instagram or facebook later. Once you add the money to your Facebook wallet you are ready to go. Tap on “Create Promotion” button. And Done. Now you need to wait until your promotion gets approved. As you can see now there is a label called “Pending approval”. It takes around 2 hours but sometimes like in my case it took around 30 minutes or sometimes less. Once your promotion gets approved than “View Promotion” button will be added below your post. You can view your promotion by tapping on that button. If you want to check your promotion result then you can tap on “View Insights” link. In “View Insights” section you can check the post impressions as well as how much money you have spent and how much is remaining. You can explore view insights section for more details. 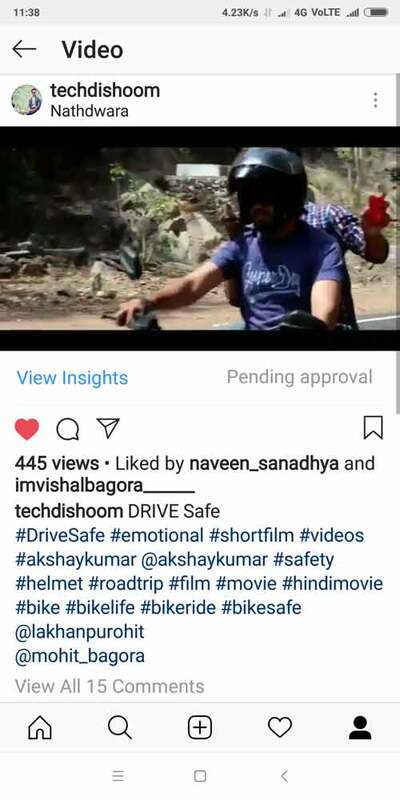 NOTE : If you still have any query regarding promote your Instagram post than comment below. Thank you! !